Almost every other visitor management software in the market today comes stacked with a host of impressive features to address any type of visitor needs. However, only a select few features, generally associated with a brand, differentiate them from the rest of the competition. Rest all other visitor management system features are common to every product. 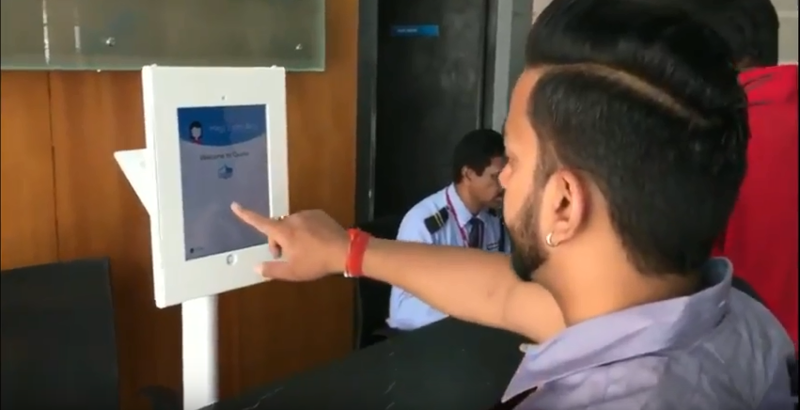 The use of Artificial Intelligence (AI) to scan visitor IDs and photo capturing, utilization of Internet of Things (IoT) to adjust the light and temperature in the adjacent meeting room where your visitor will soon join your host, might make you believe that the future of visitor management is straight out of a Sci-Fi movie. However, in this post, we’ll discuss, not the additional, but the most essential features to look for while selecting a visitor management software. Trust us when we say that some of visitor management software don’t possess even these basic features. This makes it all the more important for you to make a note of these common features (Bookmark this page) and keep it handy before going ahead into the decision making stage. Whenever a visitor checks in via a visitor management software, at that very moment, the host is notified of the visitor’s presence in the office. This is done via an automated notification system that sends out emails/text messages to their hosts as soon as the visitor fill up the required information in the software. This particular visitor management system feature works not only for your employees but also for your visitors. Your hosts, after receiving the message can also send messages back to their visitors. For instance, when a host is running late for a client meeting, they can send a quick text back to the visitor(s) saying the meeting will start in another ten minutes. Read more about Instant Host Notifications below. Host Notifications works for teams as well. This feature is often overlooked. However, it has proven to be a blessing in disguise and hence has made it on our list of top 5 features. Messaging for teams means that you can now specify who receives host notifications for an entire team. For example, you can make ‘Satish’ in charge of receiving notifications on behalf of your entire ‘Materials Management’ team. Satish, would be instantly notified whenever a delivery guy comes and meets a member of the materials management team. In this case, if that particular team member isn’t able to meet the visitor, then Satish can go himself or send somebody else to meet with the visitor. Also, if by any chance, a visitor does not select a host, a notification will again be sent to Satish, since he is the one who is receiving notifications on behalf of the entire team. He’ll get to know a guest is waiting and can provide quick assistance. You probably have more than one type of visitor, and not all of them need to go through the same check-in process. In case of a manual visitor management system checking in various visitor types was not possible. But with a digital visitor management software, all you need to do is find all the different visitor types and add each type from your dashboard to your VMS. For example, for a general visitor, you may want to capture their name, company, email, and phone number. But for a courier agent delivering a document, probably all you need is their name and company. A customized check-in process allows you to design the reception experience around each visitor who steps to your office. Apart from this, a visitor management software also provides an overall customizable experience for every visitor type. This is done by placing your company name and brand logo on the interface at all times. This style of exhibiting your logo & brand theme right at your front desk is perfect for impressing visitors & giving a great first impression. Read more about Customizable Interface for Branding below. With an increase in the number of visitors and visitor types, this highly popular visitor management system feature has become extremely important to keep information meant to be kept under the rug, actually stay under it. Businesses can protect data by asking job applicants, business partners, and colleagues to sign NDAs and other legal agreements via the visitor management software kept at your office front desk. As seen in the above feature, you can create a customized check-in process around each of your visitor types. This makes it even more complex as different visitor types would need to sign different agreements. The greatest advantage of having this feature is that now you don’t need to have tonnes of documents lying around the reception desk. Being able to simplify the paperwork and get the signing done quickly upfront saves a lot of time and hassle. Read more about digitally signing documents via a visitor management software below. Unlike a visitors book, capturing visitors data with the help of a visitor management software takes place without human intervention whatsoever. This means that you can now get unaltered, clean (yes, illegibility of handwriting is one of the major cons of having a visitor book at your front desk) and insightful visitor data that could be useful in providing solutions to your visitor management needs. With actionable visitor insights at your side, you can see patterns of the time spent on visitor engagements and optimize as you deem fit. Read more about Visitor Insights for Admins in the article below. That’s it. It’s time to decide and we won’t hold you back. Selecting the best visitor management software for your business is a huge responsibility and we hope we’ve made it easier for you. If you have any other queries feel free to add them in the comments section down below and we’ll try to address all your queries ASAP. In the meantime you can have a quick look at our own visitor management software – Ara, who has been an excellent sidekick in dealing with visitors and managing front desk with finesse for big brands here in India and abroad as well. 1 comment on "Top 5 Features to look for in a Visitor Management Software"
Thanks for sharing. How can you build customized visitor management app?